Have A Cup Of Coffee! This Guy Is Making A Fresh Pot! First, I have to thank my friend Sabrina Miller, who brought this back to me from her worldwide travel adventure! The fact that she carried “weasel” coffee to me all the way from Vietnam means more than I can express! Time For A Sip Of Kopi Luwak! From, let’s discuss what makes this coffee so unique. These cute animals are known as Civets, and they “make” this coffee in various locations in southeast Asia. It’s known as “Kopi Luwak”, coffee made from beans that have been through the intestinal system of this tree cat! A four month old Luwak is tempted by some red coffee beans at the BAS Coffee plantation January 20, 2011 in Tapaksiring, Bali, Indonesia. The Luwak coffee is known as the most expensive coffee in the world because of the way the beans are processed and the limited supply. 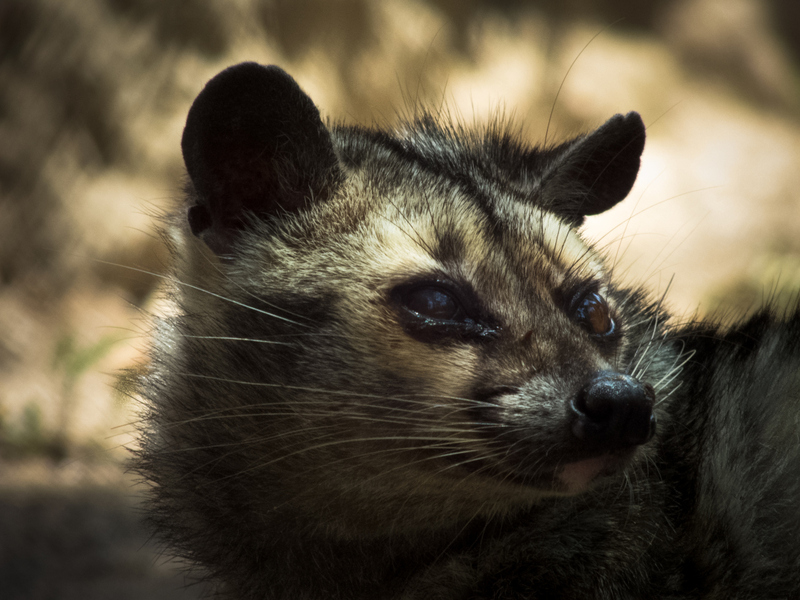 The Luwak is an Asian palm civet, which looks like a cross between a cat and a ferret. The civet climbs the coffee trees to find the best berries, eats them, and eventually the coffee beans come out in its stools as a complete bean. 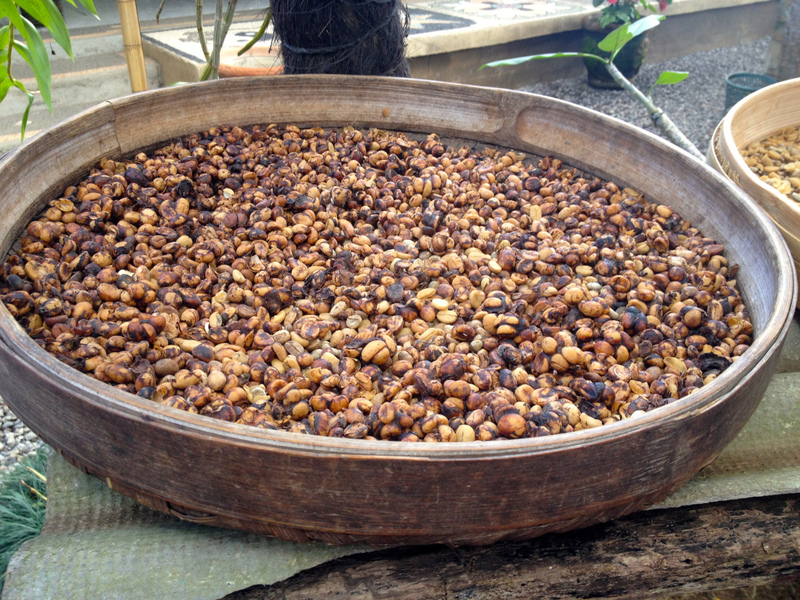 Coffee farmers then harvest the civet droppings and take the beans to a processing plant. Luwak coffee is produced mainly on the islands of Sumatra, Java, Bali and Sulawesi in the Indonesian Archipelago, and also in the Philippines. How Can You Argue With That Face? As you can see, these Civets are eager to please, and I was eager to try this coffee, and share my “tasting” with you! This coffee is terrific! Silky smooth, with absolutely NO bitterness or harshness – it’s a soft, mellow but full-bodied cuppa Joe! It actually has a rich, thick mouthfeel – and so smooth…I added a bit of milk, since that is how I like my coffee, but I also sipped it plain first, and it was delicious! My wife, Alex also tried some, and she enjoyed it as well! Michaela, who I work with, was very hesitant at first, but she also enjoyed her cup…so “weasel coffee” was a hit on all fronts! Thanks again to Sabrina Miller for this great gift – and I also wanted to share this as well: the intrepid reporters at “RocketNews24.com” were also willing to try it! If you like wacky food products, check this out! ‹ Game Show Models! Given’ Out “Exploitation” Goodies! Classic Cult Grindhouse Fun! Ha! IT’S ACTUALLY VERY GOOD! Do you really think these civets are not kept in captivity? Do you really think people are scrambling around a coffee plantation looking for little poop Easter eggs? This sounds to me like selling bottles of “wild” coyote urine that’s supposed to keep cats away from your vegetable garden: Nobody’s following those coyotes around with urine collection pans, waiting for them to squat or lift a leg. I think the origins of this coffee have been well documented, and the animals aren’t harmed at all, seems like a great way to live!